The Hailstorm Brotherhood is a fringe group of White Maw pirates who abandoned the starship graveyard's plunder to form a permanent settlement on Hoth. These men and women are more than mere survivalists, however. They are artisans and warrior-poets shaping Hoth's natural landscape according to their own designs. The massive ice spire towering above the Glacial Fissure sector was painstakingly carved from an ancient mountain by the Hailstorm Brotherhood. No one knows how many of the group's members perished making the spire a reality, but the achievement stands as a testament to these warriors' iron wills--and a warning to all who might oppose them. 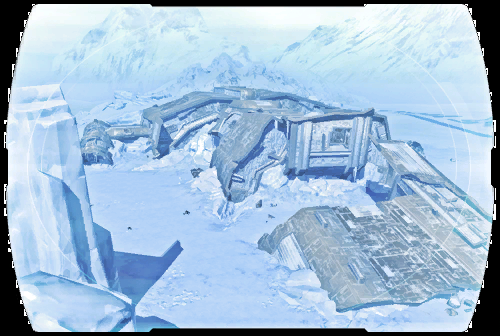 The Clabburn Tundra sector has become a key battleground in the three-way war for Hoth. The rolling snow dunes of the drift hills and the spectacular frozen geysers of the jagged plains were initially claimed by the Republic military, which saw the region as an excellent artillery staging area. However, strategic mismanagement allowed both White Maw and Imperial forces to invade and establish their own camps. Recent reports indicate some of Hoth's most hostile wildlife calls the Clabburn Tundra home, and these beasts are not happy to see their habitat invaded. Whitefangs, wampas and even the occasional tribe of attacking skels prey upon whole squads of soldiers. The Crescent Canyon Facility was established decades ago by the Czerka Corporation to explore mining opportunities beneath Hoth's frozen tundra. The operation was eventually deemed too costly to pursue and Czerka personnel abandoned the sprawling base. Later, Ortolan explorers seeking to establish a permanent settlement on Hoth moved in and took over the structures. The current conflict between Republic, Empire and White Maw has turned the facility into a battle zone. Reports indicate the Empire has invaded and enslaved the helpless Ortolans living there. Because of the facility's proximity to the Republic's Aurek Base, an immediate and strong military response is required. The sector designated as the Glacial Fissure is almost entirely White Maw territory. The deep ice canyons and extensive underground cave networks provide shelter and staging areas for the vicious pirate forces. When the White Maw's leaders saw the Republic and Imperial militaries arriving on Hoth, they immediately established well-defended camps and supply routes throughout the area. Traveling through the Glacial Fissure is suicide for all but the most well-armed and highly trained operatives. The White Maw pirates do not fight conventionally, preferring to set ambushes and traps for their victims. Both the Republic and Imperial militaries have sustained heavy losses here, demonstrating the extraordinary threat the pirates represent. Initially home to Ortolan settlers, the Highmount Ridge sector is now contested territory where both Republic and Imperial military units contend with the White Maw pirate army. These deadly cutthroats have seized control of an extensive geothermal plant, giving them a well-defended staging area from which to conduct their assaults. Fierce battles rage on the ridge's open areas, making the sector especially dangerous for travel. White Maw ambushes are common, but Republic and Imperial forces are managing to hold their own and establish footholds in the territory. Whether or not they can keep these positions is another matter. When the Empire's forces scouted Hoth for a landing site, both Imperial and Chiss tacticians agreed that the Icefall Plains sector was the best location for a military staging ground. The easy but defensible access to White Maw pirate territory rendered it ideal for both offensive sorties and a defensive fallback. More importantly, once the Republic committed to Hoth and the salvage operation in the starship graveyard, it would become the perfect place from which to launch assaults and drag out the conflict forever. Dorn Base, the heavily defended main Imperial complex, is protected by powerful shield generators and turrets. A series of smaller forward bases stand ready to alert commanders of any impending assault. Nonetheless, Republic commandos have made extensive inroads into the sector and now threaten to isolate the Icefall Plains from resupply and reinforcements. The greatest prize in Hoth's starship graveyard is a behemoth of a vessel called the Star of Coruscant. At the time of its crash, this superdreadnought was the most advanced ship in the Republic fleet--a project years in the making, shepherded along by one Colonel Omas. Its experimental weapons and breakthrough technology could have turned the war's tide, had the Empire not devoted every resource to trapping and destroying it. Not even the long fall from orbit to Hoth's hard-packed ice plains could shatter the Star of Coruscant's hull. The ship remains intact, and White Maw pirates have spent considerable effort reactivating its internal power systems and shields. Indeed, the ship is now a veritable fortress on the planet's surface. Decades ago, Imperial starships led the Republic fleet into a deadly trap above the remote ice planet of Hoth. The Republic's fabled prototype superdreadnought, the Star of Coruscant, was the Empire's primary target, but many other warships suffered the same terrible fate. The remains of these vessels fell to the planet's surface in a tightly-packed radius, creating an awe-inspiring graveyard of derelict ships. Republic vessels were not the only victims of this devastating space battle, however. Several noteworthy Imperial ships were also destroyed, their cracked hulls raining down among the enemy's remains. Years of heavy snowfall and shifting ice have obscured the many wrecks to the point that sorting Republic from Imperial ships is often an impossible task. Among the Empire's losses in Hoth's fabled space battle was a sleek, fast warship designated the Ambria's Fury. Until recently, the ship's manifest had remained a mystery to all but the highest Imperial echelons. The only certainty was that the Imperial Moffs were most distressed at the ship's loss. The Ortolan settlers on Hoth needed a renewable energy source to power their habitat in the Crescent Canyon Facility and help them expand their territory, so Ortolan engineers constructed a massive geothermal plant tapping directly into Hoth's underground volcano network. The Tromper Crags plant provided more than adequate power and heat to keep the Ortolans in relative comfort... until the White Maw came. The pirate army's leaders understood the value of controlling the most abundant power resource on Hoth and quickly stormed the geothermal plant. Any Ortolans who did not immediately submit to White Maw authority were summarily executed. Now that the Republic and Empire have come to Hoth, the Tromper Crags facility has become hotly contested territory. The Republic established its primary military lodgment, Aurek Base, in the Whiterock Wastes sector with cooperation from the nearby Ortolan settlement in Crescent Canyon. The Ortolans aided the Republic military's engineers and helped construct their mountain fortress in return for protection from the White Maw pirates. Had Republic military strategists foreseen the Empire's real plan--not to claim technology from the starship graveyard, but to draw Republic forces into an unwinnable fight--they might have reconsidered establishing anything in the Whiterock Wastes. The vast snowy plains stretching out from the mountain base provide unimpeded access to enemy forces. In retrospect, the Empire's violent invasion of the Whiterock Wastes was inevitable.